All of these scores (bar Clark) have been made since 2010. Yet, none will compare to the way Rohit Sharma catapulted his way to a mammoth 264 against Sri Lanka – a total just four runs off the biggest List A score of 268. 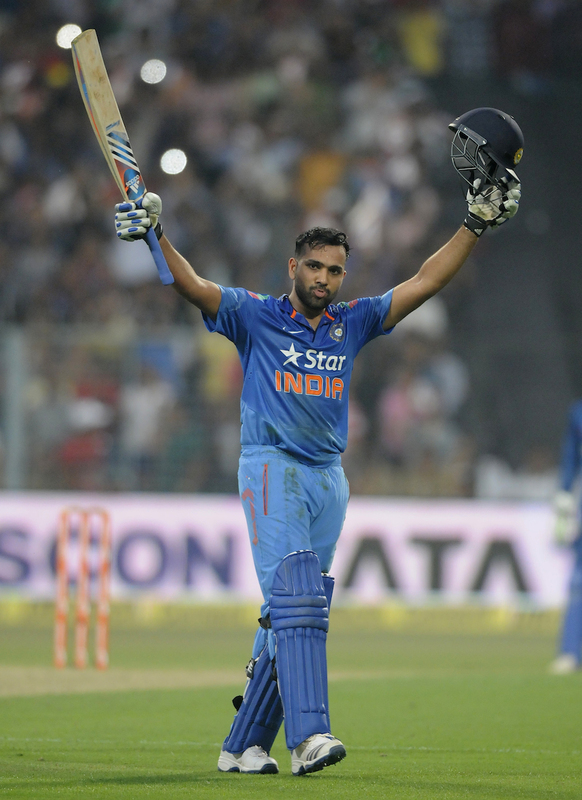 One aspect of this spectacular innings is Sharma took 72 balls to reach 50. That means his next 214 runs were hit in 101 balls – a whopping strike rate of 211.8. In just one match, he went from a 35.8 average to a 38.2 in his ODI career. While Sri Lanka were horrible in their bowling – and, subsequently, some shocking misfields – 100% of the credit must go to Sharma for putting on a clinic. India’s 5/404 takes the total number of innings scores above 400 in ODI’s to 11, since Australia and South Africa each hammered 430+ in March of 2006. Of those 11 scores, India have their name etched into the books five times; four of them at home. Granted, the condition of the Eden Gardens deck was extremely flat and prime for a big score. However, it was the incredible destruction that Sharma put on the Sri Lankan bowlers that made everyone else forget about how the ground was prepared. The test series against Australia begins in under three weeks, and, as India have previously shown on tour Down Under, what they bring is unpredictable – and usually disappointing. Sharma now has to replicate his form at Kolkata in coloured clothing come the first match he plays in the series; potentially, the first test at the Gabba beginning on December 4. Next question: can he? Rohit looks very capable with willow in hand. However, he has 314 runs against Australia in ODIs at 26, and no test matches. Even more important is how he may fare in the upcoming World Cup. The pitches – in particular around Australia – are a world away from the flat “bully” tracks of the sub-continent. Sharma’s technique is elegant and powerful. His mesmerising shot, where he lifted a ball so wide it would have been called a wide, and somehow flicked it over long-on for six, was a sight rarely seen in world cricket. The Indian crowd weren’t silent – they were deafening. India scored 130 runs from the last 10 overs. He said he was “ready to bat another 50 overs“, and that he wasn’t really tired when he came off, essentially carrying his bat from ball one to being dismissed off the final delivery of the innings. If Australia’s recent form is anything to go by, Sharma can pounce on some short bowling. The counter to that is the demons surrounding the tourists after their 4-0 thumping at the hands of the Aussies back in 2011. Indian selectors cannot 100% back their faith in Sharma at test level after just one massive score. He is more likely to play in the ODIs. Sharma’s main mission then is to (most likely) oversee operations at the top of the batting order. While the huge power and strength displayed at Kolkata is a big asset for Sharma, once again he will have to adapt to faster, bouncier wickets like the WACA and Gabba. It is a waiting game to see which India will make their way to Australia; the limp, defensive India who can’t play away from home, or a skilled and talented side who can give everyone a shake-up.